Solar Panels Sacramento - Exploring Solar Panel Kits For Sale? Ask These 6 Questions Before Buying! Do you want to go green with your energy use in Sacramento? You’re not alone. As prices continue to rise across the state of California, more home and business owners are making the switch to solar power systems. It’s a smart decision! You get to save money on your utility bills, help the environment, and become independent with your energy use—even if you may still be connected to the grid. Nonetheless, solar panel kits are for sale on the market, and we encourage those looking to use renewable energy as their primary source of power to go for it! 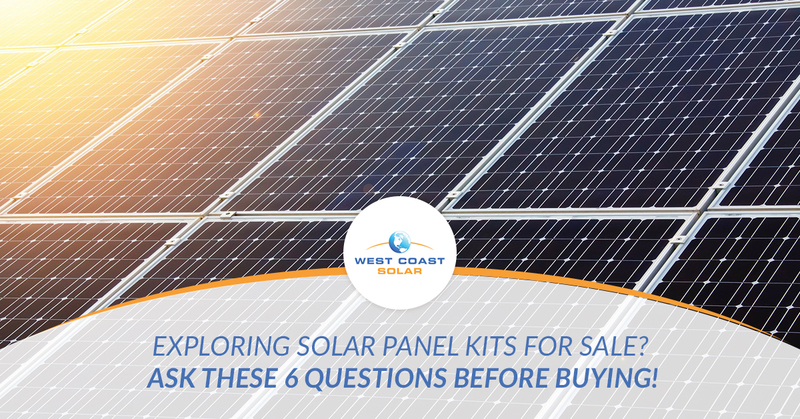 At West Coast Solar, we offer you six questions to ask about solar panel kits to make sure it’s exactly what you need to go green. Want to use a solar panel contractor to design, install, and maintain your solar power system instead? Call us today! Otherwise continue reading to learn more. Question #1 – Should I hire an electrician? Once you decide on which solar power kit you want, the components, and how you’re going to install it, you’ll want to consider how the electricity is going to make it from your solar panels to your home. At West Coast Solar, we strongly encourage you to hire a certified electrician to do the electrical work for you, seeing that it is inherently dangerous. Furthermore, if you have less than adequate knowledge about electrical systems, you could sink your ship before it gets out of the harbor with faulty wiring or incorrect installation. Question #2 – Where will I install the solar panels? This is the second most important question to ask—if not the first. You need to find a surface or location that will get you the best sun exposure for your solar panels. Without an appropriate amount of sun, your solar power system may not produce the type of energy you thought it could. Consider discussing this question with the professionals at West Coast Solar to get an idea on where to install your panels. Questions #3 – Where will you install components and batteries? A solar panel kit is more than solar panels and a few wires. It involves a number of components that make the whole system functional and work for you. You can have a solar power system without a battery, but you cannot have a system without an inverter. Finally, each component takes up space and requires a specific set up to properly function. Take note of this. Question #4 – How much energy do you need? This is a question you should ask before purchasing a solar power system, anyway. However, if you happen to purchase a solar panel kit, you will probably get more than you need when it comes to power. Nonetheless, a great place to start is how many kilowatts per day you use. If you can compare this to the amount of energy a solar panel kit can produce, you’ll get close to supplying all your energy needs with a renewable source. In most cases, it’s a good idea to install a system that has at least 20 percent more production power than you actually need. Question #5 – Which appliances and electronics do you plan on running? Pair this question with question number four, and you should be able to get really close to your daily energy use, which informs daily energy production. If you want to take going green a step further, consider getting smart appliances and electronics to reduce energy usage even more! Question #6 – Which type of solar panels will you purchase? There are a variety of materials used for solar panels. These materials do affect power production capabilities. It’s best you do your research and determine which panels would work best for you. For the most part, polycrystalline or monocrystalline panels are solid choices. Overwhelmed yet? These six questions don’t cover everything, but they will get you started on the path towards a DIY solar panel kit. At West Coast Solar, we suggest you go with a local solar panel company in Sacramento to take care of your solar power system needs. For example, we offer design, build, installation, and financial services to our customers. Don’t risk installing a solar system incorrectly or spending more time than necessary to go green. Call us today!